Georgian (ქართული ენა, kartuli ena) is the official language of Georgia, a country in the Caucasus. Georgian is the primary language of about 3.9 million people in Georgia itself (83 percent of the population), and of another 500,000 abroad (chiefly in Turkey, Iran, Russia, USA and Europe). 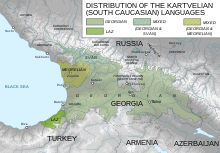 It is the literary language for all ethnographic groups of Georgian people, especially those who speak other South Caucasian languages (or Kartvelian languages): Svans, Megrelians, and the Laz. Gruzinic, or "Kivruli", sometimes considered a separate Jewish language, is spoken by an additional 20,000 in Georgia and 65,000 elsewhere (primarily 60,000 in Israel). ↑ Hammarström, Harald; Forkel, Robert; Haspelmath, Martin, eds. (2017). "Nuclear Georgian". Glottolog 3.0. Jena, Germany: Max Planck Institute for the Science of Human History. This page was last changed on 17 August 2018, at 17:59.